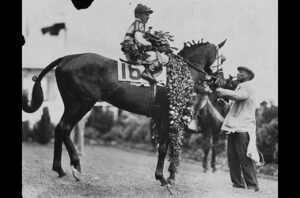 The Kentucky Derby is less than a month away and as we get ready to place our Kentucky Derby bets we take a look back at how we got here. Starting in 1875, the Kentucky Derby was run on a piece of land located just outside of Louisville, Ky. That piece of land became known as Churchill Downs and the Derby has been held annually ever since. This makes the Derby one of the longest running sporting traditions in the world. The Kentucky Derby was modeled after a race in England named the Epsom Derby. Since the first running of the Derby, the event has morphed into a horse race attended by 10,000 people in 1875 to an event that had an attendance of 165,000 last year. The Kentucky Derby prides itself as being the biggest spectacle in all of horse racing. In fact, the Kentucky Derby’s social atmosphere is what keeps people coming back to the track each year. While you can bet on horses at many of the various windows at Churchill Downs, the Derby gives patrons an excuse to put on their best clothes and mingle with the stars. Millionaire’s Row is a popular place to spot popular actors and sports athletes. Did you know that Michael Jordan, Peyton Manning and even high profile actors such as Ashton Kutcher have all been spotted at the Kentucky Derby? The Kentucky Derby has a history of bringing out the stars and that is why this event is like no other in the world.